Mahashivratri, “the Great Night of Shiva” is the most significant event in India’s spiritual calendar. Sadhguru explains what makes this night so important, and how we can make use of it. Sadhguru: In the Indian culture, at one time, there used to be 365 festivals in a year. In other words, they just needed an excuse to celebrate everyday of the year. These 365 festivals were ascribed to different reasons, and for different purposes of life. There were to celebrate various historical events, victories, or certain situations in life like harvesting, planting, and reaping. For every situation there was a festival. But Mahashivratri is of a different significance. The fourteenth day of every lunar month or the day before the new moon is known as Shivratri. 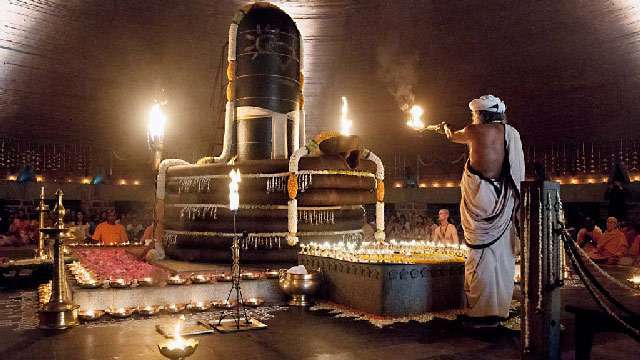 Among all the twelve Shivratris that occur in a calendar year, Mahashivratri, the one that occurs in February-March is of the most spiritual significance. On this night, the northern hemisphere of the planet is positioned in such a way that there is a natural upsurge of energy in a human being. This is a day when nature is pushing one towards one’s spiritual peak. It is to make use of this, that in this tradition, we establish a certain festival which is night-long. One of the fundamentals of this night-long festival is to ensure that – to allow this natural upsurge of energies to find their way – you remain with your spine vertical – you stay awake. After many millennia in meditation, one day he [Shiva] became absolutely still. That day is Mahashivratri. Mahashivratri is very significant for people who are on the spiritual path. It is also very significant for people who are in family situations, and also for the ambitious in the world. People who live in family situations observe Mahashivratri as Shiva’s wedding anniversary. Those with worldly ambitions see that day as the day Shiva conquered all his enemies. But, for the ascetics, it is the day he became one with Mount Kailash. He became like a mountain – absolutely still. In the yogic tradition, Shiva is not worshipped as a God, but considered as the Adi Guru, the first Guru from whom the knowledge originated. After many millennia in meditation, one day he became absolutely still. That day is Mahashivratri. All movement in him stopped and he became utterly still, so ascetics see Mahashivratri as the night of stillness. Legends apart, why this day and night are held in such importance in the yogic traditions is because of the possibilities it presents to a spiritual seeker. Modern science has gone through many phases and arrived at a point today where they are out to prove to you that everything that you know as life, everything that you know as matter and existence, everything that you know as the cosmos and galaxies, is just one energy which manifests itself in millions of ways. Shivratri, is the darkest day of the month. Celebrating Shivratri on a monthly basis, and the particular day, Mahashivratri, almost seems like celebration of darkness. Any logical mind would resist darkness and naturally opt for light. But the word “Shiva” literally means “that which is not.” “That which is,” is existence and creation. “That which is not” is Shiva. “That which is not” means, if you open your eyes and look around, if your vision is for small things, you will see lots of creation. If your vision is really looking for big things, you will see the biggest presence in the existence is a vast emptiness. A few spots which we call galaxies are generally much noticed, but the vast emptiness that holds them does not come into everybody’s notice. This vastness, this unbounded emptiness, is what is referred to as Shiva. Today, modern science also proves that everything comes from nothing and goes back to nothing. It is in this context that Shiva, the vast emptiness or nothingness, is referred to as the great lord, or Mahadeva. All longing to know the unbounded, the oneness in the Existence is yoga. The night of Mahashivratri offers a person an opportunity to experience this. Every religion, every culture on this planet has always been talking about the omnipresent, all-pervading nature of the divine. If we look at it, the only thing that can be truly all-pervading, the only thing that can be everywhere is darkness, nothingness, or emptiness. Generally, when people are seeking wellbeing, we talk of the divine as light. When people are no longer seeking wellbeing, when they are looking beyond their life in terms of dissolving, if the object of their worship and their sadhana is dissolution, then we always refer to the divine as darkness. Light is a brief happening in your mind. Light is not eternal, it is always a limited possibility because it happens and it ends. The greatest source of light that we know on this planet is the sun. Even the sun’s light, you could stop it with your hand and leave a shadow of darkness behind. But darkness is all-enveloping, everywhere. The immature minds in the world have always described darkness as the devil. But when you describe the divine as all-pervading, you are obviously referring to the divine as darkness, because only darkness is all-pervading. It is everywhere. It does not need any support from anything. Light always comes from a source that is burning itself out. It has a beginning and an end. It is always from a limited source. Darkness has no source. It is a source unto itself. It is all-pervading, everywhere, omnipresent. So when we say Shiva, it is this vast emptiness of existence. It is in the lap of this vast emptiness that all creation has happened. It is that lap of emptiness that we refer to as the Shiva. Light always comes from a source that is burning itself out. Darkness has no source. It is a source unto itself. So when we say Shivratri, which is the darkest night of the month, it is an opportunity for one to dissolve their limitedness, to experience the unboundedness of the source of creation which is the seed in every human being. Mahashivratri is an opportunity and a possibility to bring yourself to that experience of the vast emptiness within every human being, which is the source of all creation. On the one hand, Shiva is known as the destroyer. On the other, he is known as the most compassionate. He is also known to be the greatest of the givers. The yogic lore is rife with many stories about Shiva’s compassion. The ways of expression of his compassion have been incredible and astonishing at the same time. So Mahashivratri is a special night for receiving too. It is our wish and blessing that you must not pass this night without knowing at least a moment of the vastness of this emptiness that we call as Shiva. Let this night not just be a night of wakefulness, let this night be a night of awakening for you.